I have stayed away from discussing this topic, however, over the Winter I found myself engaging in various conversations with numerous Rwandan diaspora and them expressing their opinions and frustrations with the Miss Rwanda contest. Plus, the competition is like on going and its about to be booming. Before I continue, I want to remind everyone that critiquing something does not mean you are against it (even though it usually ends up being so) but it may also mean we are looking for platforms to suggest ways of improvements. Miss Rwanda is aimed to be an opportunity for women in Rwanda to show their ability to represent the country, its interests and culture as well as empower other women. Theoretically the competition is a great initiative but like many things, realistically it fails to do many of these things. It’s history, its formation and so on, I must be honest, is unknown to many (myself included). However, that is really not I will be focusing on. Rather, I will be talking about the way Miss Rwanda continuously reproduces systems of inequality (rooted in global structures). There is a tendency of Rwandans to rely on subjectivism as a way of knowing. Scholar Blythe Clinchy explained that “subjective knowers look inside of themselves for knowledge” and that “truth is personal” in her work “On Critical Thinking and Connected Knowing”. We, Rwandans, tend to think that just because we have not witnessed things, they do not exist (much of the world is like this). Sometimes we fail to recognize how some of the things we do are a part of global issues like white supremacy or capitalism. We disconnect ourselves from the world- socially- thinking or hoping that this will eventually happen. However, the danger of this becomes that we become blind to the systems of inequality thereby normalizing our own oppression and reproducing the systems and engaging in the oppression of our own people and cultures. Even though it is not true, many Rwandans say that there are no requirements to be a part of Miss Rwanda- except that you are supposed to be the age between 18-25 [like once you are passed 25, you can no longer be beautiful (ageism right here)]. Additionally, you also have to be a certain height, and a certain size- except we don’t think this is a requirement but “magically” 99% of the time, the contestants are size twos and four. This is considered common sense (unquestioned) because obviously only these types of bodies can be (have been deemed) beautiful. The contestants are also supposed to be fluent in a foreign language- preferably English. And the conversation we all want to deny, colorism. Basically, like scholars such as Audre Lorde, Bell Hooks and Okoye, the measurement of beauty for non-white bodies, is how many Eurocentric features you have. Therefore, the fairer your skin is, the skinnier, taller, younger you are- the more beautiful you are presumed. Many of the beauty standards set by Miss Rwanda already go against the aim of Program. The beauty standards do not adhere to the culture. I know that in Rwandan communities, curvy and full bodies are viewed as beautiful. I, like many Rwandan girls, grew up in a household where to be thick is to be beautiful. However, this is not to say that this is right because all bodies are beautiful but for the purpose of unpacking Miss Rwanda- we settle on it. How often do we see curvy and FULL bodies in miss Rwanda? Rarely. Almost never! Now, one can say that “Oh but no one stops them from contesting”. You are right! No one restricts them. However, let me tell you about a time I went to a Miss Rwanda finalist show where there was a curvy full-bodied woman. I think it was 2014 when I went to it. There was a woman who was what we would describe as plus size in the show. As she crossed the stage, I remember people next to me saying “dore Mama Munyana nawe yaje ngo abe Miss” and others saying “abana mu rugo nibo bagukeneye” and many saying “ubuse uriya abaye Miss, yatumarira iki?” Many women, including my mother and her friends contributed to this fat-shaming experience. When the plus size contestant did her catwalk, people laughed at her, already assuming she would NOT win. To the audience, her body was a symbol of motherhood (hence the comment of abana and mama Munyana). Additionally, the audience engaged in an unconscious dialogue that equated the ability to be a Miss (and beautiful) to a small sized body. So, how come our [Rwandans] day-to-day definition of beauty is not reflected in Miss Rwanda? Like many countries, the structure of the contest is westernized [and Eurocentric]. We have inherited a system of judging beauty that is not organic to our own community thus as long as it remains like this, it will always fail to reflect Rwanda’s uniqueness. From the media, which is controlled by the West, we assume that the only people capable to be a part of the competition are those that fit the Eurocentric image of a Miss. Beauty standards are not the only things that are Eurocentric in Miss Rwanda, let us talk about LANGUAGE. Language! I have been doing research on indigenous languages of the world for a while. I study the similarities in the Afrikan languages and the Native American languages, many of which are now extinct. I use Native American languages to map the journey languages go through before extinction and then try to locate Afrikan languages on that scale. Back to Miss Rwanda and language. I mentioned that in the competition, the contestants are supposed to be fluent in a foreign language. When the contestant is answering the questions in the semi-finalist round, they are given three languages to “choose” from- English, French and Kinyarwanda. NEVER, and I mean never in my life (I am young so I stand corrected) has any contestant chosen to answer in Kinyarwanda. The contestants will struggle (understandably) to articulate themselves in those foreign languages because while Kinyarwanda is mentioned as an “option”, it really is not if the contestant wants to win. It would be naïve to say that all languages hold the same weight. Guess what language holds the least weight? Kinyarwanda! I do not know what would happen if one was to answer in Kinyarwanda but I have a few ideas on how people who react to them. They would be considered uneducated and incapable of being a Miss. Recently Naima Rahamatali who has stayed in Canada for 19 or so years decided to contest but it became a BIG deal that she could not speak the language [fully]. Journalists had no respect for her to the extent they did not bother to call her by name but rather referred to her as “Miss utazi I Kinyarwanda”. Tweets flooded questioning whether she could or could not be miss because she couldn’t speak Kinyarwanda and unofficial sites ridiculed her. Similarly, when a contestant cannot speak proper English or French, she is equally ridiculed. They make memes of her and humiliate her effort. It is as though, in order to win Miss Rwanda, you are supposed to know Kinyarwanda but silence that aspect of your identity to adhere to Eurocentric standards. Miss Rwanda becomes a platform to re-emphasize globalization and even more emphasize the inferiority of native languages. When we engage in conversations that publicly humiliate these contestants, we refuse to recognize how we are playing into certain institutional restrains and what the results become. 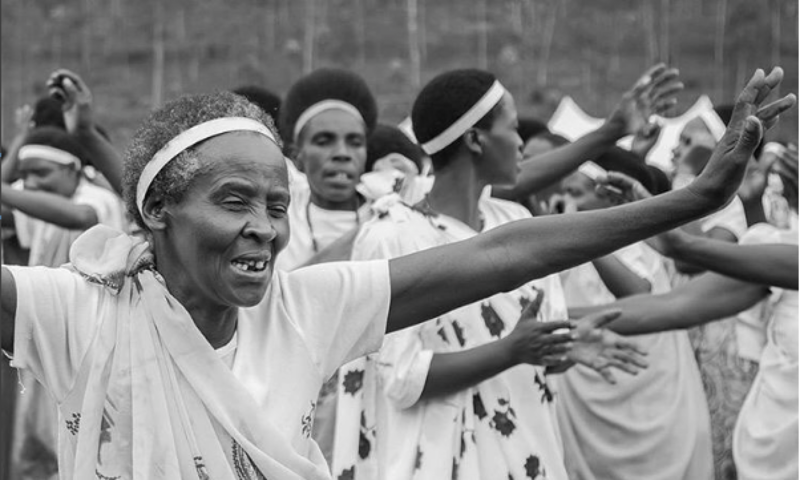 Rahamatali represents a third of the youth population today in Rwanda. Many do not speak Kinyarwanda- EVEN THOSE WHO WERE BORN AND RAISED IN RWANDA- do not speak it fluently. By ostracizing Rahamatali, we make her case a personal issue rather than an institutional downfall. We silence [ignore] conversations analyzing the influence of globalization on our country, how institutions are part of the problem as we do not learn Kinyarwanda and how Kinyarwanda is of less value than foreign language and how we reproduce these in our everyday life. By ridiculing contestants who cannot speak fluent (or as we say proper) foreign languages, we disconnect ourselves from analyzing the institutions’ hand in this because a student from Gitwe cannot be as fluent as a student from Glory. Even though we know that not all schools in Rwanda are given equal resources, we simply ignore this instead of using Miss Rwanda as a starter to conversations on change. As Rwandans, we pride ourselves on our “Agaciro”. We have taught ourselves that no one can take away or give us our dignity and humanity. We fight everyday with the West trying to control our decisions, be it foreign aid or elections- but we think too big. We think that only “big” things such as aid and constitutions will liberate us not realizing that chains are made of small individual particles of an element. We do not fully understand that things such as Miss Rwanda can be revolutionary, a way to emancipate ourselves from the 1/3 world and its ideologies and a way to call for a redistribution of resources across institutions. Miss Rwanda calls for us to think critically on the education system, “post” colonial influence, the intersectionalities between our economy and society and generational divides. The Miss Rwanda competition can be an opportunity for the younger generation to move away from the traditional ideology that the entertainment industry [film, poetry and music included] is silent during evolutions of the economy. In order for the competition to do this, the audience and contestants need to fully understand its vision and nature. We cannot recognize the strength in something we do not understand. First, I just want to say how much I LOVE this blog. I have learned sooo much from reading all the stuff here and I like how much passion you put into this. Hearing your thoughts is really refreshing, especially from a fellow Rwandan and from a young person’s perspective. I’m also really glad someone finally addressed the issue of Miss Rwanda. It is supposed to be representative of our culture, undermining Kinyarwanda and putting western beauty standards on the frontline DOES NOT reflect the core values of the Rwandan community. And it’s really sad… but the first step to change this is to raise these issues and make people aware of their existence. Although I think it’s still a long way to go until the Rwandan people themselves really understand this. I recently discovered your blog and I am addicted! You are both an eloquent writer and phenomenal activist. I am learning a lot from you.Thank you so much for sharing your thoughts and the lessons you’ve been learning throughout your experience! Kudos to you!! This is really very interesting but one thing maybe we both need to understand is we either have a long way to go or we have no way to go at all! If we were to start with the basics; this blog would have been written in kinyarwanda, probably not on a computer say I don’t know how Rwandans traditionally kept their messages! The point is we are surrounded and wrapped in what you call the “eurocentric” world. Let’s look at what would happen if they considered your suggestions: she doesn’t know English so she wdnt even communicate as near as Uganda, she wdnt participate anywhere because the standards everywhere are what they are, say projects.. how do u promote tourism without speaking to the target audience. The only way you can change these things my dear, go back to stone age and start allover again!